There's been talk in the last few days of splitting California to create the 51st state, but advocates have the names all wrong. (OK, the idea is lame too, but we'll get to that in a minute.) Jeff Stone, a Republican Riverside County supervisor proposes splitting California along the lines in the map above. He calls the new states "North California" and "South California." Seriously? He has Los Angeles in North California. He's also put cities that are further north than San Francisco (like Bridgeport) in South California. Huh? A much better name for these two states would be East California and West California. Or better yet, since Stone's real goal to to separate Republicans from Democrats, he might consider my naming suggestion in the bigger map above. 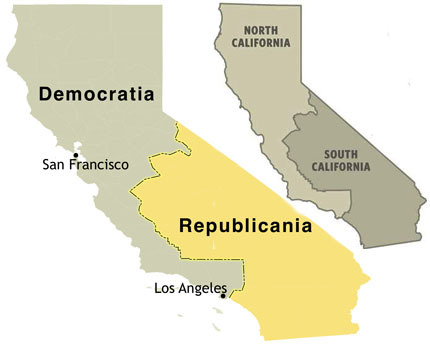 It's true that California should have split a long time ago... and it almost did in 1859 (Watch our video on this). But any proposal that puts Los Angeles and San Francisco in the same state... no one will take that seriously. More on the scheme here.